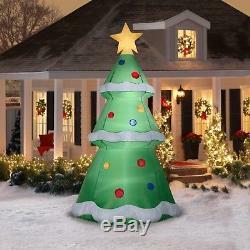 Decorate your front yard for the holiday season with this Amazing 10' tall Christmas Tree Airblown Inflatable Christmas Prop. This festive, life-size lawn ornament features 10' tall Christmas Tree! Recreate this magical moment with this inflatable Christmas prop. 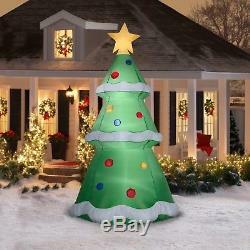 The inflatable 10' tall Christmas Tree is made of 75-percent fabric, 15-percent plastic and 10-percent metal materials. It is simple to set up and will transform your home into a winter wonderland. The inflatable Christmas ornament can be enjoyed by the whole neighborhood. After the holidays, deflate it and pack it away for safe keeping to use again for years to come. Includes 4 base stakes, 4 tether stakes & ropes, 1 Airblown Inflatable, 1 extra lightbulb and fuse. Gemmy Industries Airblown Inflatable 10FT Christmas Tree Gemmy Industries Airblown Inflatable 10FT Christmas Tree. Airblown Inflatable, 1 extra lightbulb and fuse. A great addition to any Christmas dcor. Plug in, self inflates in seconds. 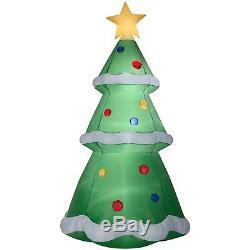 The item "Pre-Lit Airblown Inflatable 10 Ft.
Christmas Tree" is in sale since Tuesday, November 6, 2018. This item is in the category "Collectibles\Holiday & Seasonal\Christmas\ Current (1991-Now)\Yard Décor". The seller is "*smartconnect*" and is located in Riverside, New Jersey. This item can be shipped to United States.